World Champion Vladimir Kramnik is back for another clash against chess computer. This time he will face Deep Fritz in a 6 games match. The match will be played on November 25th-December 5th in Bonne, Germany. WorldChessNetwork will provide Live Audio broadcast for this event. First round is scheduled for Saturday, November 25th, and commentator will be GM Alex Finkel. Alex is very patient, answering all the questions from audience. November 25th Update: First game drawn. 2nd game is scheduled for Monday, November 27th at 9am EST. GM Alex Finkel will be audio commentator on WCN. November 27th Update: Kramnik blundered mate in one. This probably hasn't happened since his childhood. 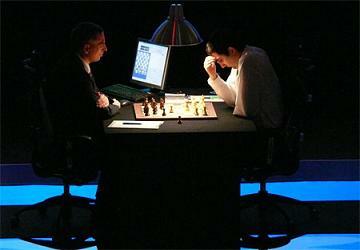 The blunder can have significant psychological consequences on Kramnik's play in next 4 games. The game itself started with a nice trick of Vladimir Kramnik who played weird move order to kick Deep Fritz out of his books. He gained advantage with black pieces and had control until the unfortunate blunder. Third game will be played on Wednesday, November 29th with live audio coverage on WorldChessNetwork. November 29th Update: Third game was drawn. The Catalan opening was played again, and it looked like Kramnik was in favorable position. However, after couple of Kramnik's soft moves, Deep Fritz got passed a-pawn with balanced material. Exactly at this point, we have seen superiority of the human, even if Kramnik was only fighting to secure the draw. Program didn't even bother to stop exchange sac for neutralizing passed pawn because his calculations were showing that he has material advantage (rook for bishop+pawn). Deep Fritz is incapable of recognizing motive of fortress, something that every 2000 human player is aware of. December 1st Update: I am sure many of us would feel uncomfortable with Knight on h5 and opponent's doubled Rooks, but not Vladimir Kramnik. This was "one of his positions", where he was slowly improving his pieces to the most optimal squares. Not even 1.e4 could help Deep Fritz achieving something, easy draw with no sweat. 5th game will be played on Sunday 9am, GM Larry Christiansen is providing audio comments for WorldChessNetwork. December 3rd Update: Another transposition in the opening. 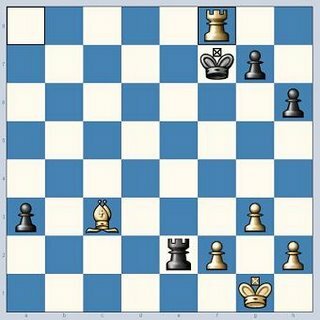 After short flirting with Ragozin Defence, Kramnik took the game into Nimzo Indian waters. He had nice prospects in view of bishop's pair in open position, but Deep Fritz had the opportunity to claim open d-file. Instead of castling, Kramnik used his h-pawn and lifted rook to harass opponent's King. The game ended in draw after the moves were repeated. Deep Fritz is leading 3-2, last game is scheduled for Tuesday, December 5th at 9am EST. December 5th Update: Deep Fritz won the 6th game and match with overall score of 4-2. Vladimir Kramnik surprised the viewers by choosing Naidorf Sicilian with black pieces. I can't remember seeing him playing this line. 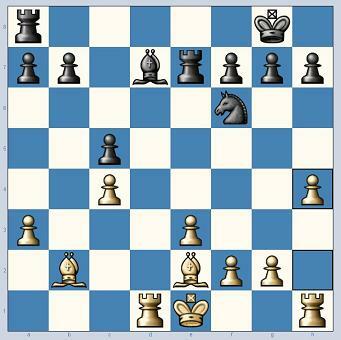 Fritz played amazing 10.Re3 novelty, a manoeuvre that was never tried before. After 25. e5! de5 26. Re5 Be5 was not possible because 27. Qe5 f6 28. Bg6 would win on the spot. Fritz took a4 pawn on move 30 and the rest was matter of the technique.